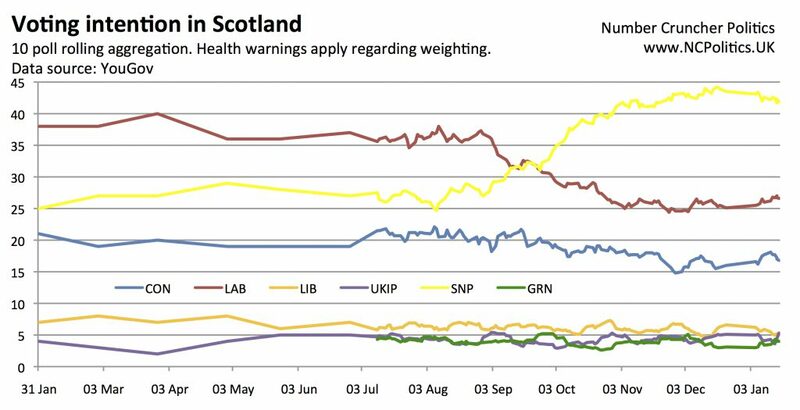 Big divergences between pollsters seem to be par for the course in Scotland – we saw very similar picture for the referendum, until they converged in the final stages. Panelbase has tended to show among the smallest SNP leads, so a margin of just 10 points should be seen in that context. Nevertheless, a 7-point reduction in the SNP’s lead will be welcome news for Jim Murphy and his party. The tables haven’t yet been published, but John Curtice provides a writeup here. Key points include an initial net approval rating of -12 for the new Labour leader, an improvement -16 last time for Johann Lamont. The less good news for Scottish Labour is that Nicola Sturgeon is rated +10 (for reference, Alex Salmond’s +17 in 2012) and the really bad news is Ed Miliband’s -46 among Scottish voters. Turning to my aggregated model, which provides comparisons over time, Labour’s gains are smaller but the trend is in the right direction, with figures of SNP 42 (-1) LAB 27 (+1) CON 17 (-1) LIB 5 (-1) UKIP 5 (+1) GRN 4 (+1). The electionforecast weighted model was little changed SNP 44 (=) LAB 31 (-1) CON 11 (=) LIB 6 (+1) UKIP 2 (=) GRN 4 (=). I’m not aware of any forthcoming Scotland-wide polls, but Lord Ashcroft’s constituency polling is currently in the field. You hadn’t forgotten about the Tooting by-election, had you?